After what appears to have been a wild night at sea under a nearly full moon and up to 30 knots of wind at times.....the fleet has mostly entered the west end of the Strait and is currently parked. 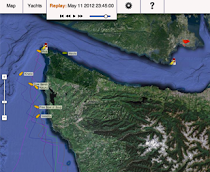 The two lead boats, Rage & Kinetic V on the other hand, are now near Sooke and approaching Race Rocks. They seem to have gotten into a new wind from the NE and are approaching the final turn at Race Rocks at around 7 knots of boat speed. Riva, which was making great progress as the most southerly boat heading down the Strait, decided to consolidate, move North, and now they too are parked, hobbling NE at just 0.7 knots. This "wind wall" may just give the two lead boats Rage & Kinetic V enough of a window of opportunity to finish fast and put some time between themselves and the rest of the fleet before the predominantly westerly afternoon breeze and incoming tides get fully established. 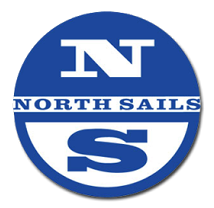 They'll first have to don headsails for the final leg between Race Rocks and the finish, as the wind will be on the nose, NE @ 11 knots!